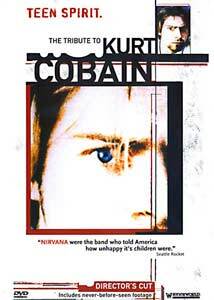 "Nirvana were the band who told America how unhappy its children were." What music defines a generation? What performers will be passed down from my adolescence to my children, and so on? My parents showed me the wonders of The Beatles, Simon and Garfunkel, and numerous other musical acts, but I can't help but be afraid of the fact that my generation is sadly lacking the caliber of musical performers that I was introduced to. Perhaps the closest would be Nirvana, a band that, with the help of musical acts from the Seattle area, redefined rock and roll for an angrier, more doubting generation. It is understandable then that Teen Spirit: The Tribute to Kurt Cobain might be an informative look back at the life and talent that launched a thousand imitators. Sadly it is not. Since Courtney Love holds many of the rights to Nirvana songs and other properties, seeing a "tell all" documentary on Cobain's troubled life is highly unlikely, considering that at the current time, Love is locked in an embittered battle with the remaining band members for control of materials and that any progress is at the least a long way away. So what does Teen Spirit: The Tribute to Kurt Cobain have to offer? The simple answer is not much, but what is included is better than other quickly released documentaries on the legacy of Cobain and Nirvana. It features interviews with local music reporters as well as with Nils Bernstein, the publicist of the now infamous Sub Pop record label. While these interviews are far from being groundbreaking or even informative, there are still some aspects of the life and death of Kurt Cobain that are handled nicely. I admired the documentary for focusing on other bands in the Sub Pop family and that it showed the truth that Nirvana was never at the head of the Seattle movement, but rather a small time group who hit it big. Still, there is the fact that Teen Spirit: The Tribute to Kurt Cobain never allows the viewer to learn much about Nirvana. Instead we see interviews with people who don't seem to know much about the band, only that they were from Aberdeen and that Kurt committed suicide. We do see clips of Kurt and drummer Dave Grohl, which is something more than other documentaries have shown. But there is a constant empty feeling throughout the film that makes it a sort of non-event for fans. Image Transfer Review: Presented in full frame, Teen Spirit: The Tribute to Kurt Cobain is far from a stellar video presentation. The images are constantly grainy and have a soft look that hampers the overall quality of the image. Sharpness and detail are lacking, while colors are not as vibrant as they should be. Overall this is a very poor image transfer. Audio Transfer Review: The Dolby Surround track for Teen Spirit: The Tribute to Kurt Cobain is largely center channel focused and is nicely done for the most part. Dialogue sounds fine with little distortion, and the constant background music comes across nicely. An average, but nice track. Extras Review: Static menu screens and ten chapter stops are featured. Anyone with even a remote interest in Nirvana will likely already know much of the information offered by Teen Spirit: The Tribute to Kurt Cobain, but the documentary does have its moments even if they are few and far between. Meanwhile, we are all left waiting for the ultimate Nirvana documentary; until then, I suppose we just have to make do with what is offered.